Should You Hire a Tax Debt Relief Company? Can You Consolidate Tax Debt? Can Tax Debt Be Included in a Chapter 7 Bankruptcy? How Long Does Tax Debt Last? How Does the Fresh Start Tax Program Work? What Happens to Tax Debt When You Die? Can You Negotiate Tax Debt With the IRS? Taxes can be complex. They involve math. They involve taking a hard look at what you earned and spent during the year. And while sometimes I enjoy filing taxes — usually when I’m getting a refund! — other times, as a freelancer, I find myself faced with a bill that’s kind of overwhelming. If you’re in that situation right now, you may be researching tax debt relief. Tax debt relief is one of the most-googled phrases for a reason: A lot of people need this kind of help. You may not feel able to pay what you owe in full if . . .
That’s not a great position to be in. Penalties and interest can start to accumulate; your debt can go to collections; your credit score can be affected; and the IRS can even put a lien on your home and other property. The government really wants you to pay your tax debt, and it has a lot of tools to encourage you to do just that. If you really can’t pay in full, though, there are some legitimate tax debt relief options out there. Using one can help you get right with the IRS or with your state or local revenue agency. It may involve tweaking payment plans to allow you to get caught up or, under limited circumstances, reducing or forgiving your tax debt. Hiring a tax debt relief company can be tempting. 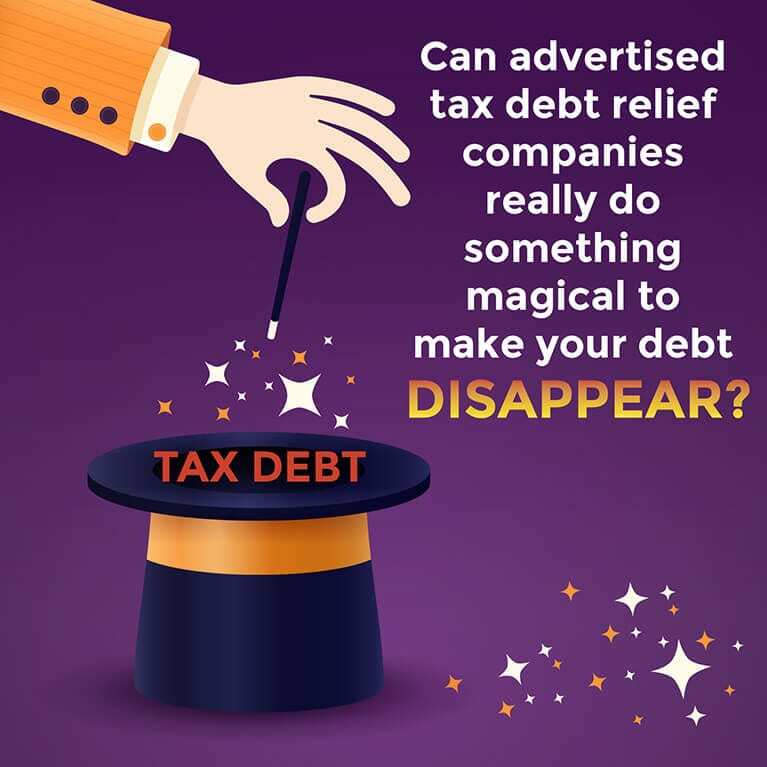 Typically, the advertisements you’ll see promise that you can turn your whole problem over to it and avoid the intimidating prospect of dealing with the IRS yourself. However, the Federal Trade Commission and other consumer protection groups say that doing this is usually a bad idea. Many tax debt relief companies offer unnecessary services or are even flat-out fraudulent. At best, you’ll pay one of these companies quite a bit of money you could otherwise put toward your back taxes, all the while receiving a service you could have provided yourself; the IRS does not require you to use third-party representation for any of its tax debt relief programs. At worst, you might give thousands of dollars to a company that never files the paperwork it said it would and refuses to give you a refund. If you really want to work with a tax debt relief expert, I recommend hiring a reputable local accountant. Make sure you understand how much his services will cost and what his policies on refunds are, and look him up with the Better Business Bureau to see how he is rated. If you’re consolidating other debts by taking out a lower-interest loan, you can most likely include your tax debt in that consolidation loan. Of course, you should check to make sure the loan has lower interest than your tax debt does. If that proves to be the case, and consolidating makes sense otherwise, it might be worth it to simplify your financial life in this way. Tax debt relief is a key reason people file for bankruptcy. However, only some kinds of tax debt can be included in a Chapter 7 bankruptcy. Property taxes due more than a year before you file bankruptcy may also be dischargeable. Other types of tax debt can’t be included in a bankruptcy. You’ll still be on the hook for Medicare taxes, employment taxes, tax penalties from the last three years before you filed, and more. Generally, the IRS has 10 years to collect what you owe in taxes. If your tax debt is more than 10 years old, speak to an accountant about your situation. 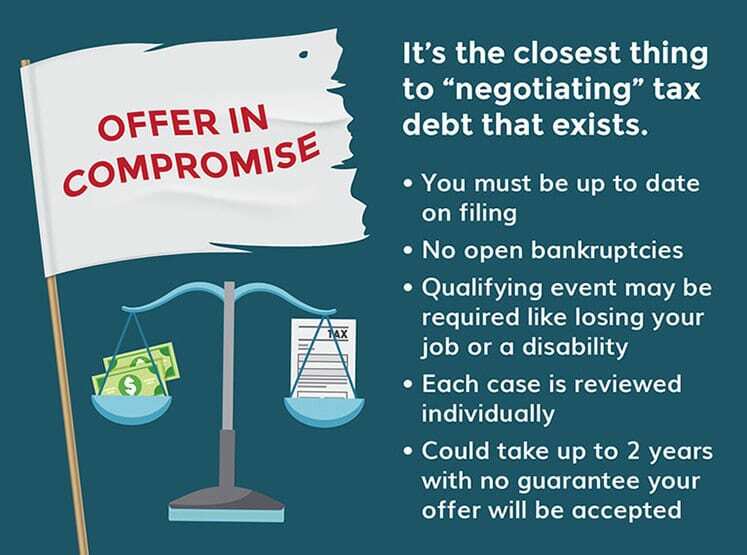 It’s important to understand that certain events, like filing for an “offer in compromise” (see below), can restart the 10-year clock, so you may not be in the clear even with old debts. That’s why it’s critical to speak to an expert who can help you understand your circumstances. Instead of hiring a tax debt relief company, your best option is to pick up the phone and call the IRS or your state government’s equivalent. 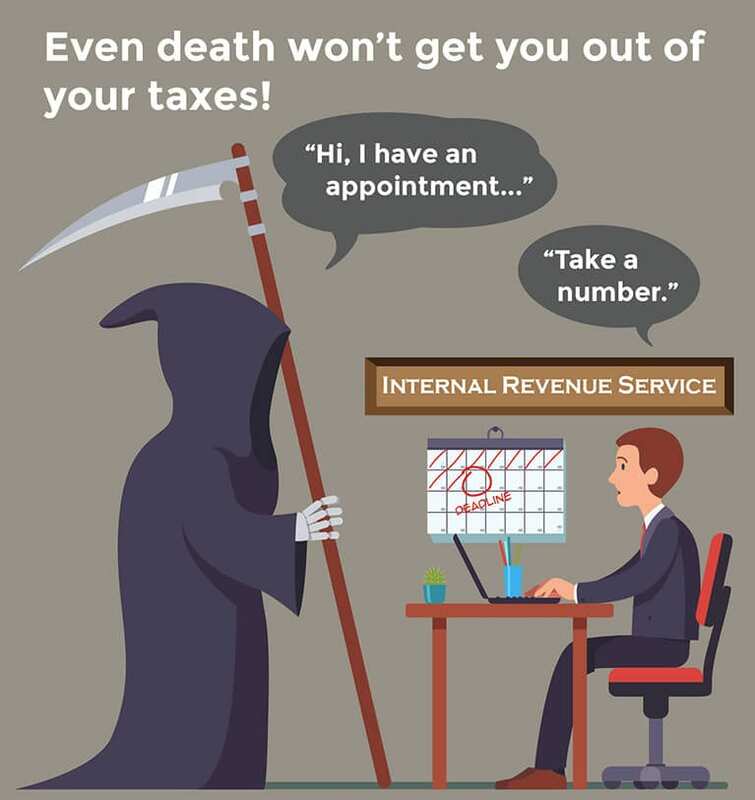 You can even walk in to your local IRS office and deal with it in person. Before you make the call, you’ll want to have the best available picture of your finances. What are your assets? What are your expenses? Do you think a payment plan would be beneficial, or do you need something more serious? If your situation is complicated, you probably already have a tax attorney, and that person may be able to help you out. But if you’re like most people, you can work through your problem with an IRS representative and find out what your options for settling your tax debt are. Some people will just pay in full, but others will take advantage of what’s usually called the Fresh Start initiative. Lots of people speak about the Fresh Start tax program, but it’s really less of a program and more of a collection of options for people seeking tax debt relief. It basically amounts to a more flexible, forgiving set of rules with which the IRS evaluates your finances to determine what kind of tax relief you qualify for. The IRS looks at your finances carefully to determine how much you can be expected to pay. Before Fresh Start, it considered four years of future income; now it considers only one or two, depending on how much tax debt you have and how long your payment plan will last. The IRS can’t collect tax debt from you if doing so would cause a crisis in your finances. So it has to decide what your minimum monthly spending is. That still doesn’t include vacations to Mexico, but it does now take into account credit card minimum payments, student loan minimum payments, and bank fees, among other items that were previously left out. Not the most pleasant question, but one you might have to think about anyway: Can tax debt be inherited? Tax debt does remain after death, but fortunately, your heirs won’t inherit the debt directly, so the IRS won’t ask them to personally pay it. Instead, your estate will need to make good on it or face the same kinds of penalties a living person would, including a lien. In practical terms, what this means is that before your heirs can receive any proceeds from your estate, the tax debt must be settled. The estate’s administrator may be able to achieve a settlement with the IRS, but the most likely scenario is that unless your estate is smaller than the tax debt owed, the entire amount will have to be paid before your heirs can receive remaining assets. If you are facing an overwhelming tax bill as either an individual or a small business, your first step should be to consider whether a payment plan would help you. Sometimes it’s enough just to break down the bill into smaller installments. You can even apply online under most circumstances. As of 2018, individuals can apply for two kinds of installment plans. 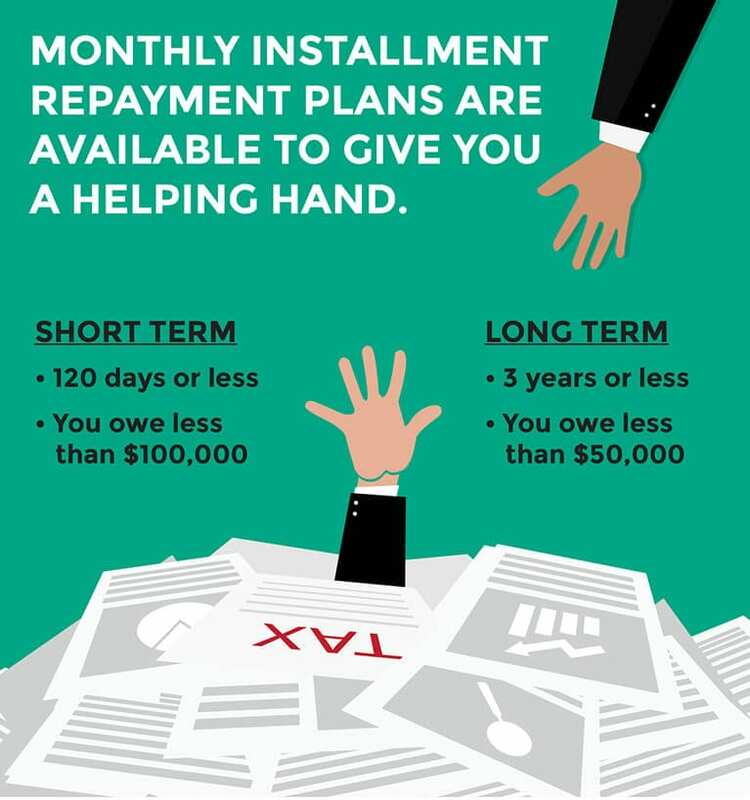 You’re eligible for a short-term payment plan if you can pay in 120 days or less and owe less than $100,000, including penalties and interest. You’re eligible for a long-term payment plan if you owe $50,000 or less. Approval of payment plans is usually simple, unless you owe an astronomical amount. If at all possible, set up auto debit so there’s no possibility of not making your payments on time. If you’re experiencing temporary financial hardship, the IRS may be willing to delay putting your tax debt into collections. You’ll need to speak to an IRS agent, fill out a form, provide proof of financial hardship, and accept that your tax debt will not go away as a result of this temporary delay. In fact, it will get bigger, because penalties and fees will accumulate the longer the process goes on. But if you are a small business or a self-employed person facing a very temporary cash flow issue, this option for is, especially advantageous for getting limited but immediate tax debt relief. If you think you qualify for innocent spouse relief, your circumstances are such that you’re definitely going to want to speak to an accountant — and probably a divorce lawyer! Many married couples file their taxes jointly, and the IRS typically considers both partners liable for any tax — plus applicable penalties, interest, and so on — that is due. But what if your spouse lied on the return, and you had no reason to know about it? Let’s say your wife had under-the-table income from a side business you didn’t know she was engaged in. When the IRS finds out, it will want to collect taxes and penalties from you as well as her. You can get total or partial relief from this kind of tax debt. If you establish that you were innocent in the matter, your tax liability can be forgiven; otherwise, you may at least be able to disentangle your own new liability from your spouse’s. If you have severe financial hardship, one of your best IRS tax debt relief options is what’s called an offer in compromise. It’s the closest thing to negotiating tax debt that there is. This kind of relief is a little like what happens in bankruptcy, when creditors agree to accept less than they’re owed because they will at least get something. 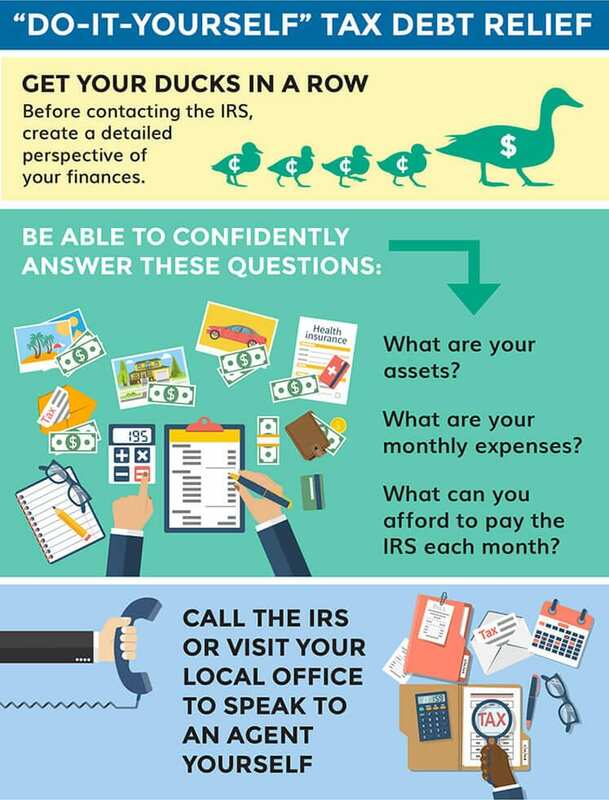 Based on your assets, income, and expenses, you make the IRS a reasonable offer and your tax debt may be settled in full. Qualifying for an offer in compromise can be difficult. One situation that might work in your favor: You lose your job or experience a dramatic drop in income in a business, owe a lot of money, and are unable to pay it back. Another situation: You become disabled and have dramatically lowered income expectations. You’ll have to prove it, though. To be eligible for this kind of IRS tax debt relief, you have to be up to date on all your tax filings and not be involved in an open bankruptcy proceeding. The IRS has a “pre-qualifier” tool that lets you enter your financial information (including assets, income, and expenses) and suggests a preliminary proposal amount. Your other financial obligations, such as student loans and state and local taxes, are considered when the IRS calculates this number. If you submit an offer in compromise, the IRS will investigate your individual circumstances and determine if your offer is acceptable. (This might take as long as two years.) Generally, it’s acceptable “when the amount offered represents the most we can expect to collect within a reasonable period of time,” according to the IRS. That’s a little vague, because they consider each person’s circumstances individually, but what it tells you is that they’re not going to give you a break just for the heck of it. They want to collect as much as they reasonably can. If your offer in compromise is accepted, you can either pay in full or in installments. If you’re finally ready to pay your tax debt — hopefully after some of it has been negotiated or forgiven — you should start at the IRS payments website. The IRS has many options for paying tax debt, including the Electronic Federal Tax Payment System, wire transfers, check, or even cash. In the end, most people will find that there’s only one thing to do for real tax debt relief: Pay as much as you can and get everything settled. But there’s a silver lining. If you get right with the IRS, then instead of searching for tips on tax debt relief, you can start planning how to spend your tax refund!